Okay! Musume Time: Jumpin' For More - SUPER☆GiRLS 'Everybody Jump!' PV Review! 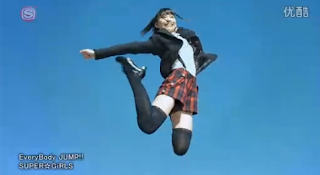 Jumpin' For More - SUPER☆GiRLS 'Everybody Jump!' PV Review! All thoughts and opinions on the group, song or PV are solely my own and no one else's. In no way do I mean to offend anyone, however, if you do not like my opinion, you do not have to continue reading what I like. We all have freedom of thought; I just choose to write my thoughts on certain groups or songs down rather than bottle it up. 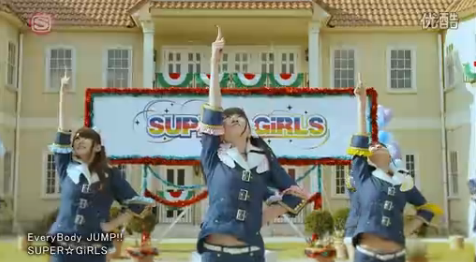 In no way am I a big fan of SUPER☆GiRLS, but a casual listener. 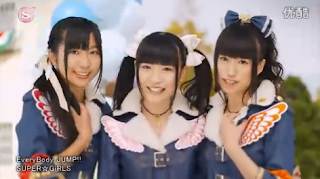 I discovered them in the middle of 2011 and haven't really followed them much other than watching the PVs that were uploaded of the girls, so, in a way, I am still rather new to them. I know none of their names, and I don't know much about them other than the fact that they're a type of group where they seem to copy other group formula's, put them together, and create something from there. Which is why I guess they are such a good group, in a way. I know that some people have a problem with this concept when it comes to SUPER☆GiRLS, but in all honesty, I don't - I mean, nothing is original anymore, and if this is what will make them popular, then I say go for it. 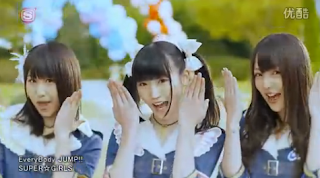 However, I do recall that when I first saw a video of theirs, I wondered why they had such a PASSPO☆ look about them, until I heard that they were 'copies' of more popular and mainstream groups. Heck, I asked my sister what she thought the first time she saw Everybody JUMP! 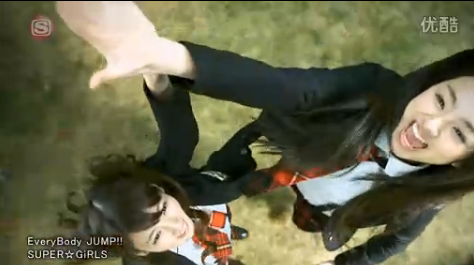 and her immediate reaction was 'Are they trying to copy PASSPO☆? 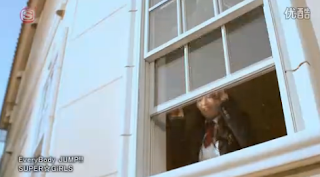 ', which made me realise how obvious the group is when copying another popular group. In the end, I have found that I like this group more than I dislike them, simply because their music is (very) Idol-Generic and catchy, and the group are quite entertaining on their own, in a way. When I first saw this, I thought of PASSPO☆'s ViVi Natsu, and then I thought of S/mileage's Suki-chan! Am I the only one who gets freaked out by the girl who has orange on her? Anyone? Even if you guys jump, you'll still get splashed with water! I can fly, YOU CAN FLY? Man, I love these jumping shots! And she;s a squeak muffin. Ooooh, yummy tummies! Much appreciated, SUPER☆GiRLS! In all honesty, when I first heard that this single was coming out, I wasn't really that interested - but that's probably because I am simply a casual listener of the group, rather than a mega super-duper fan, however SUPER☆GiRLS have once again managed to surprise me. 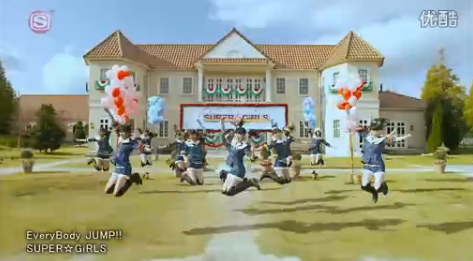 When I first heard a SUPER☆GiRLS song, I was blown away by them - but I still wasn't a fan. 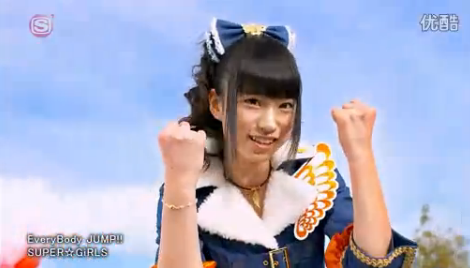 And, once again, they seem to have surpassed expectations and have really drawn me in with this PV. As my sister said when she saw it for the first time 'WOW, a PV that is all about jumping and not just half-arsed like most PVs about a certain subject', which I whole-heartedly agree with. I mean, I haven't come across many songs that focus on Jumping (Other than JUMP by C-ute), but it was really nice to see everyone in the video jumping around for different reasons, like Basketball or high-fives (speaking of High-fives, after watching this video, Give Me Five feels so half-arsed based on the songs title now). 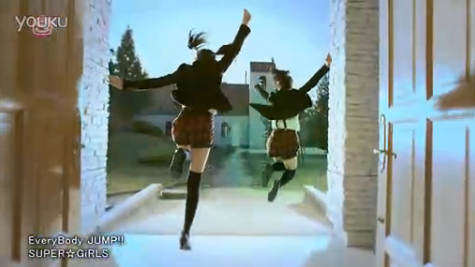 So, as you have probably guessed by now, I like the PV - Simplicity works in the favour of SUPER☆GiRLS right now, and they execute it so well whilst still sticking to the meaning of the song; Jumping. 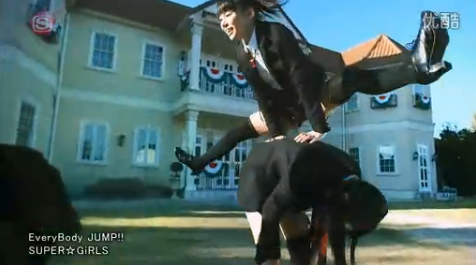 We get a PV that has no story line, but a whole lot of jumps in slow motion, or other varied forms like leap frog. It was entertaining to see so many different forms of jumping crammed into the video, and the dance itself was really entertaining - There was a lot of effort put into this video, and all they used was a field, pretty much. Oh, and some other places. Now, I adore this video, but there were some similarities that I couldn't mistake when I watched the video. 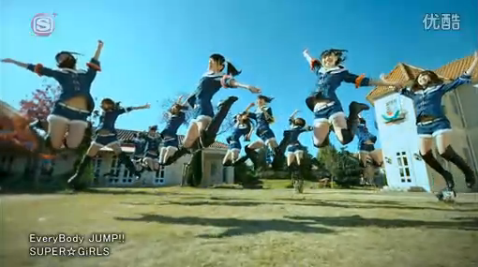 I swear, some of those jumps reminded me of my beloved Seishun Collection, and the uniforms they dance in? 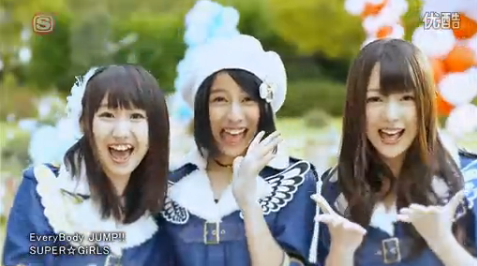 Gosh, aren't they just PASSPO☆ like in a way? 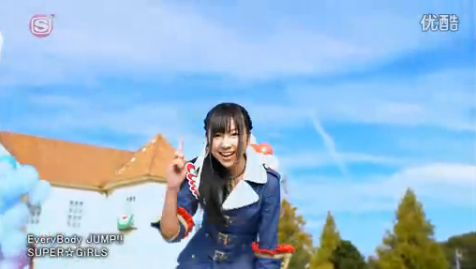 And the balloons just remind me of Suki-chan, for whatever reason. 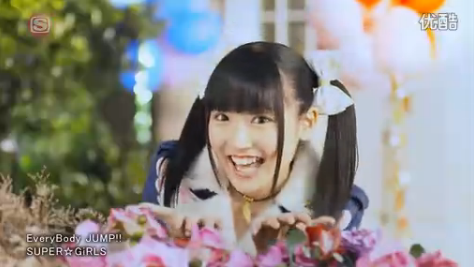 In fact, the field reminds me of Suki-chan, but that could just be me. 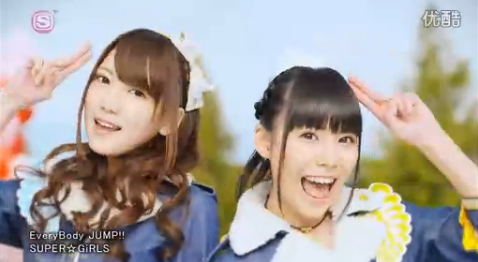 These girls also look quite AKB-ish, in a way, but whatevers. 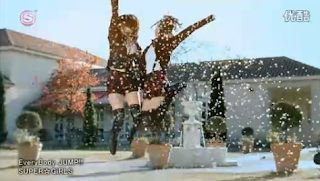 Anyway, there really isn't much to say about the PV other than the fact that it is very good and very entertaining, with a lot of jumping and smiling and awesome leg shots. PS, if you are a knee high egoist, you might like this video for the knee high socks and boots. Regarding the song, you can probably guess that I like it. That generic Idol-like feel to it makes me like it a whole lot, and this song seems to have a familiar sound to it, one that I have heard from another group before. I can't put my finger on which group (dude, I do this a lot), but it's a group I know, for sure. But, despite that, I really enjoyed the song. It's very soft but energetic, and it's really fun to listen to. I enjoy the little Ikuryou's thrown in there and the solo's. Damn, those solo's are awesome! The longest solo was the best, by far. That girl has a damned nice voice. 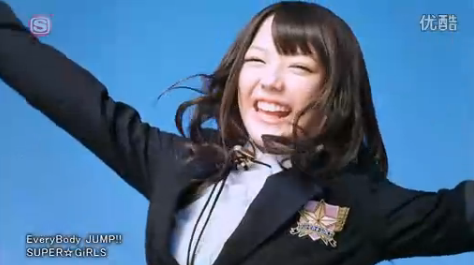 Also, that instrumental break where they all dance - probably one of the coolest dance breaks I have heard in a while. The pacing of it just makes me think of breaking out my own dance moves. But if I did that, I would probably break something. Anyway, take a look at the PV and see if these SUPER☆GiRLS take your fancy! I'm probably gonna be back for more now.